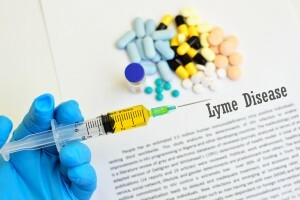 Anyone diagnosed with Lyme Disease who continues to suffer any symptoms after being treated with antibiotics, should consider that their symptoms are caused by the antibiotics they took, and not necessarily due to a continuation of the Lyme Disease. Any continuation of Lyme symptoms that is due to the causative agent, Borrelia burgdorferi, will most likely be due to antibiotic-resistant strains of Borrelia burgdorferi and the associated antibiotic-induced imbalances. As a chiropractic physician who has spent a great deal of time analyzing and writing about the science behind candida and the role of antibiotics in creating systemic fungal candida, I have become very familiar with the long-term effects of antibiotic use and their ability to induce many conditions and diseases. From cancers to malnutrition to asthma, allergies and life-threatening colitis, the dark side of antibiotic use is seldom discussed openly, and almost never by those in the medical fields who prescribe them. Widely misunderstood as to how they induce the changes they create, antibiotics are typically thought of as the miracle drug that we can’t live without. This miracle class of drugs, however, kills more people than AIDS each year and it is the gateway to an untold number of symptoms, conditions, and diseases. Abdominal or stomach tenderness, Anxiety, inflammation of the joints, joint or muscle pain, pain, unusual tiredness or weakness, stomach cramps, stomach pain or tenderness, tightness in the chest, back, leg, or stomach pains, chest pain, discomfort, or burning, severe stomach pain, lower back or side pain. Lower back or side pain, swelling of the joints, joint or muscle pain, muscle pain or stiffness, muscle spasm of the neck, abdominal or stomach cramps, unusual tiredness or weakness, back, leg, or stomach pains, sleepiness or unusual drowsiness. Aggression or agitation; anxiety; bizarre behavior; confusion; depression; fear of death; chest pain; extreme tiredness; fever; muscle pain; pain/cramps; weakness. That the exact symptoms of PTLDS and antibiotic use are the same is unmistakable. In spite of this, most people who end up with PTLDS are never given this information. This type of omission is very commonplace in medicine today. It is the hallmark of a profession that has lost its way. These symptoms can also appear via another common pathway associated with antibiotic use – systemic fungal candida. Fungal candida is known for driving inflammation in the body via several mechanisms that have been related to arthritis, pain syndromes, autoimmune diseases, and cognitive disorders. The common list of 100+ common candida symptoms easily encompasses the PTLDS symptoms. PTLDS and systemic fungal candida are both tied to previous antibiotic use. The science behind this relationship is well established in mainstream science, but seldom discussed in mainstream medicine. Given that the causation is the same, it can safely be said that the approach to correcting many of the imbalances that cause PTLDS would be the same. The Candida Plan is designed to reverse the effects of antibiotics by correcting the fungal form of candida back to its normal yeast form, detoxifying the body, boosting the correct immune response, and helping to support healthy bacterial flora. All of these help to correct the runaway inflammation in the body that is the basis for all of these symptoms. Get started on Dr. McCombs’ Candida Plan today and end the never-ending cycle of medication and error.